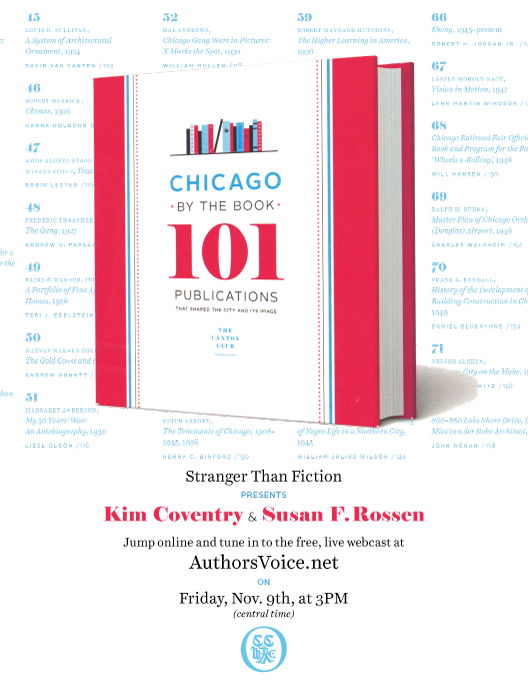 See Kim Coventry and Susan Rossen discuss the making of the soon-to-be published Chicago By the Book: 101 Publications That Shaped the City and Its Image. Coventry and Rossen cochaired the committee that put this volume together. The program is free, live, and interactive! Send in your questions and find out how the members of the Caxton Club of Chicago—a venerable Chicago bibliophilic organization—selected the final 101 titles that helped define our city. With this beautifully produced volume, Chicago’s rich literary tradition finally gets its due. Each title—carefully selected by the Caxton Club—is the focus of an illustrated essay by a leading scholar, writer, or bibliophile. Arranged chronologically, , the essays can be read in order from Juliette A. Kinzie’s 1844 Narrative of the Massacre of Chicago to Sara Paretsky’s 2015 crime novel Brush Back. Or one can dip in and out, savoring reflections on the arts, sports, crime, race relations, urban planning, politics, and evenMrs. O’Leary’s legendary cow. The show airs at the Author’s Voice Facebook page or at AuthorsVoice.net. If you miss the live broadcast or would like to watch again, visit the website or the network’s YouTube page. AuthorsVoice shows are always available online.